An open letter to Christine Blower, General Secretary of the National Union of Teachers. Copy also sent by email on 22/05/2016. This letter follows on from the original complaint of 16/5 and the NUT response on 18/5. Firstly, thank you for your response to my email. 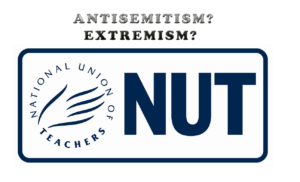 However, your letter, including the statement from the PSC, is so absurd that it simply raises further questions both about the PSC and the NUT. As those who follow my writing know, I never film anything. I go to some very hostile places and cannot openly do anything. My mission at events is effectively to remain unnoticed. I do not believe that there is a single piece of self-shot footage *anywhere* on my blog. So this statement creates additional problems. Why are they suggesting they caught me filming? What makes this claim more absurd, is the inclusion inside the event programme of a #hashtag (#Nakba68). It seems odd that an element placed to encourage ‘spreading the word’ about the event, would accompany a policy of a ‘media blackout’. Additionally, with everyone carrying a mobile phone and most using social media, it would be unusual not to say anything and expect nobody to use a phone. I did take a photo, but then so does everyone. I doubt even the PSC are going to go as far as suggesting I was evicted for taking a photo of the panel. Even if someone had mistakenly shot footage in a ‘no filming event’, the person is simply told to stop filming. After all what is the point of eviction? If the camera is the problem and not the person, simply ask them to put the camera away. In this case, not only was the person rather than the camera clearly the problem, the entire scenario surrounding the eviction that is presented by the PSC makes no sense. The PSC seem to suggest they did not tell anyone filming was strictly prohibited, and simply evicted me on the spot rather than warn me to stop. And then there is the issue of me never filming. Do you really believe this narrative? The PSC called into question my integrity on two matters, the eviction and the content of the event. I will deal with both. To focus, I need to put aside detailed comment on the specific reference to the armed struggle of 1935-1939, politically loaded as it may be. Even the inclusion of 1935 rather than 1936 is important. However, his comments on ‘not ruling out any form of struggle’ cannot possibly be cast aside. They are also exactly as I described them. He seems to be suggesting that suicide bombing of buses is not to be ruled out, nor is bombing clubs, attacking schools, pubs, parties or religious events. You supported this event and hosted it. 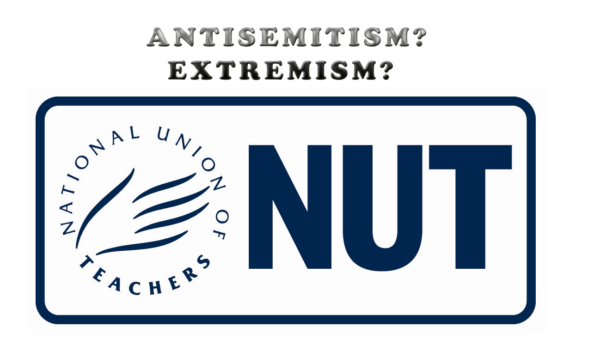 You back the PSC and your ‘ex NUT president’, Philippa Harvey, was speaking ‘on behalf’ of the NUT at the event. Do you believe that suicide bombings on public transport (remember 7/7), or in pubs (remember Bali), of terror attacks at schools (remember Toulouse) are ever acceptable? My friend Dominique was waitressing at a blues music bar, when she lost her life to a suicide bomber in Tel Aviv. I had been with her just hours before the attack. The pub was my ‘local’. Maybe the British lad who carried out the attack was influenced by the National Union of Teachers? Why do you support, protect and defend a group that propagates and disseminates such information and opinion to an audience inside your headquarters? How does spreading a message like this not contribute to an atmosphere of terrorism and extremism? Do NUT funds make their way into assisting this type of extremism? Are these really the standards of the National Union of Teachers. Is this representative of the opinions of hardworking teachers throughout the UK? The NUT hosts and supports an event during which blowing up children in fancy dress or murdering people at a Passover ceremony, cannot be ruled out? Perhaps all of the teachers inside the NUT need to stand in front of the classes they teach and tell the children just what their subscription fees help to promote. As you can see, despite the claim detailed in your response, I have as usual, simply reported the events as I have seen and understood them. Next for the eviction. Notice here, I am specifically being refused entry. And in this, there can be no question of my filming anything. So it seems odd, that they now appear to be trying to suggest my behaviour was responsible for not allowing me back into the event, when they hadn’t needed this reason to exclude me from participation in the first place. They simply said no and refunded the money. Do you still believe their ‘filming’ story? All of this of course is true. I support a negotiated two-state solution. I work for peace. I never cause any trouble. So one wonders which aims and objectives I do not agree with? This email received no response, it was simply ignored. I go to many events and come away, perhaps not agreeing with what I heard, but with nothing to report. All that interests me are those that piggyback on humanitarian issues to provide an outlet for personal hatreds or extremism. Opposition to specific Israeli policies I ignore, striking at Jews or Jewish history because you wish to deflate Zionism, or overtly supporting terrorism, simply has to be challenged. As such, I couldn’t let an extremist movement like the PSC hold an event inside the National Union of Teachers HQ without there being someone with an eye for detail to witness it. It is a political marriage I regard as obscene. So this time a friend registered, from an email the PSC haven’t already associated with me. One with a name many would recognise as Jewish. 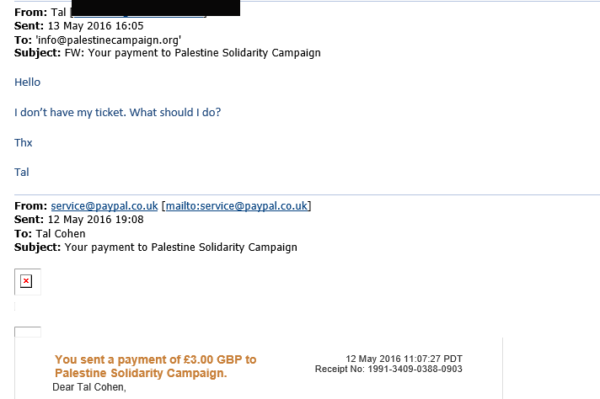 On 12th May ‘Tal Cohen’ registered for the event and paid a ticket. Although Tal received an automated response, she heard no more, and so on Friday, she followed up with an enquiry about her ticket. There was no response at all this time (are you beginning to notice a pattern?). It was Tal’s failure to receive a ticket that led to my need to arrive and purchase a ticket at the door. This led to my final eviction. It is also important to point out that to date, Tal has had no notification of a refund. 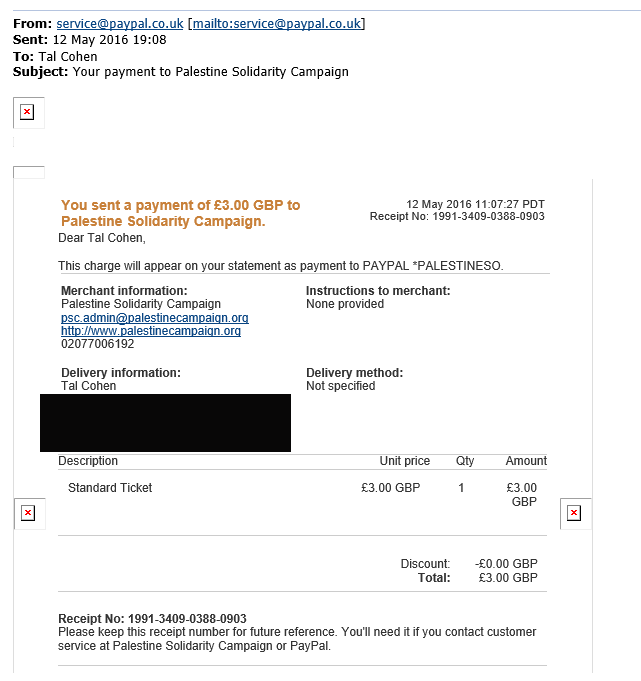 Now what may I ask had Tal Cohen done to warrant having her £3 taken and her registration ignored? Besides of course having a name that may identify her as Jewish. Isn’t this also a question that needs to be asked? In addition to any other queries you may have, can you please ask for them to refund this £3? After all, given that even terror attacks on schools cannot be ruled out by this group, we wouldn’t want them to have more money than they already have. Or at least any normal person wouldn’t. Would you? Given all this, I think it is important you return to the PSC and ask for a more coherent response than the one you received. I also strongly advise you to consider just what the NUT is supporting here. You suggest in your response that you ‘challenge anti-Semitism’. I imagine you also have a policy to challenge extremism. It is time to find out if you are serious. There are issues here that at least need further investigation. Challenge away! Perhaps they’ll now realise they’re being watched. These people are unreconstructed fascists . They are absolute in their rejection of anyone presenting opposing views . They prefer to talk to like minded individuals in their own echo chamber . Their objectives and methods are just plain evil . No wonder they prefer not to be observed and reported . Their objectives ARE antagonistic, antisemitic, discriminatory. They dont have methods. Essentially a talk fest of haters looking for a subject. Keep keeping those bastards honest. Not quite sure how u do it…..
What u describe sound like an underground fascist group I thought had died with Franco, and not a ‘public’ meeting. Wow. What a dishonest crew they are. I’m inclined to wonder, given the current political scenery, how many of those delightful NUT enablers are members of the Labour Party. They would fit right in.